Guys can sport eyeliner too! If you've been wondering how to apply eyeliner, men, look no further! While conventional wisdom and common practice dictate that it's the women who favor this trusty cosmetic product, there's no law that states a man can't take advantage of it too! Whether you wear it on stage or simply as a personal preference, you know what a difference the right application technique can make. The beauty of eyeliner is in its magical ability to make the eyes stand out for miles and miles. The brightest green eyes can look like gemstones with a hint of black liner around the rim, and brown eyes suddenly take on a whole new personality when paired with a touch of violet liner. Clearly, makeup works wonders, but it's not only women who benefit from this eye-popping product. 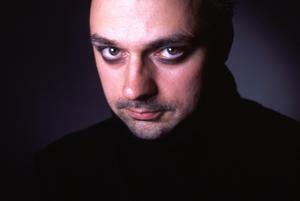 Even men are getting in on the action, taking a cue from a variety of inspirations: the makeup on musicians such as Dave Navarro and Green Day lead singer Billie Joe Armstrong, the goth-inspired looks so popular amongst youth today and the larger-than-life eyes that amp up an actor's stage presence. The old adage is indeed true - the eyes have it. Here's how to Apply Eyeliner, Men! Ask any woman who's attempted to draw a clean stroke with liquid eyeliner on her top lid; the first try is never easy. Don't be disheartened if the concept of applying eyeliner seems foreign to you at first. With just a little bit of practice, you'll get the hang of it in no time. Depending on what your purpose is for wearing it, there are a few different methods you might rely on. Here's how to do it without a lot of fuss. Making an impact on stage has just as much to do with your costume and makeup as your performance. Your character is all the more believable if your wardrobe reflects the persona you're trying to portray. You'll find that even the smallest details, such as your eye makeup, can make a big difference! Captain Jack Sparrow, anyone? Eye makeup for the stage usually serves the purpose of making the eyes look much larger than they would otherwise. With all the shadows and light involved in a typical stage production, actors require plenty of makeup to ensure that their faces stand out across a crowded auditorium. Use thick liquid eyeliner on stage to achieve maximum impact; paired with equally dark shadow and mascara, those eyes will definitely make a statement! Often, lining on the top lid is enough for a man, although the lower rim may also be lined if the roll calls for something especially dramatic. Use a sharpened black eyeliner pencil to line the entire eye (both above and below the lash line). Next, smear the liner to acquire that imperfect look. If you adhere to Wentz's method, you'll know that perfect eye makeup isn't really coveted by most men going for the rock star look! Then you'll want to smudge your eye shadow on the top lid if you choose to wear it. This contributes to the smoky, dark effect. Lastly, go to sleep! That's right, guys. You'll want to break one of beauty's biggest rules and hit the sack with your makeup still on. Why? Well, day-old eye makeup enhances the "dirty" effect that complements this look so well. Just be prepared to commit to plenty of sheet- and pillowcase-washing! So apply eyeliner men, and don't shy away from it if you really want to make a statement. Not sure which brands to try? You can't go wrong with an inexpensive drugstore pencil, such as one from Wet 'n' Wild (don't be fooled by the utterly low prices; some of the line's products are longtime cult favorites for women the world over). But if your masculinity prefers you purchase something gender-specific, consider an enhancing eyeliner from 4VOO. The line specializes in men's skin and cosmetic products.